Tired of using Windows – try out these operating systems for a change. Here we are going to know about Top 5 alternative Operating Systems for the computer. These Operating Systems have the potential to replace Windows & you can try installing them if you have an old Desktop or Laptop. You can safely install these without worries. All the 10 OSes mentioned here are lightweight & require less time to install & setup. They are perfect for Home Use. Ubuntu is one of the strongest competitor for Windows itself. It has all the features of Windows, plus its open source & is very user friendly. The only change one will find is that the taskbar is in the Left side & Notification are in the top bar. Another curious fact is that the close, maximise & minimise buttons are placed at Upper-Left corner of Window. In Windows it is in the Upper-Right corner. Pressing the Start button in Keyboard opens up Dash which is Ubuntu’s App Launcher+Search Window. You have LibreOffice which can open MS Office files & you can also edit them. New Software can be downloaded from Ubuntu Software Center which is built-in. When you use Ubuntu, you don’t need to fear about Viruses, as Linux distributions like Ubuntu will not get affected by Virus(unless specified). The Built-in Video Player can play most of the formats, but if you’re not satisfied, just download VLC Media Player for Software Center. There also a Program called WineTricks to run Windows Programs on Ubuntu(Yes, you can run MS Office using Wine. I’ve tested it). It has Thunderbird Mail preinstalled & configuring it is so simple. In fact, The State Govt. of Kerala was the first in India to make Ubuntu as their Government Operating System to support the FOSS movement in India. Download Ubuntu from Ubuntu Website. 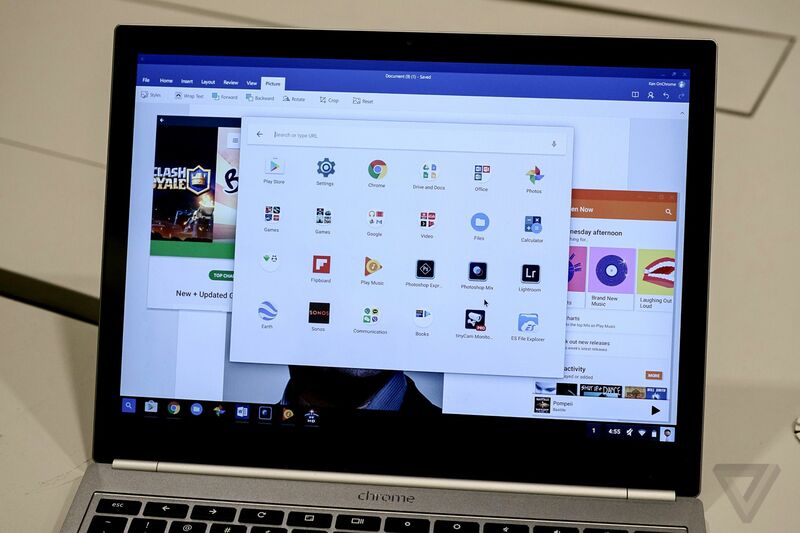 Google’s Chrome OS was perceived to be some type of Operating System which should be run only on specially designed Laptops & not on other Computers & Desktops. The Chrome OS is simple & fast operating system aimed at a light computer user. It is suitable for basic computing tasks. Can check emails, browse internet & play browser based games & can also create & edit documents. You can use Google Docs for Viewing & Editing documents, spreadsheets & Presentations. It is very light on using system resources. Laptops can get more battery life than what is stated in Specs sheets. Use it once & you will never stop liking it. Google says that they’re planning to bring Android Apps to Chrome OS. And if this happens, it will be a top class Operating System. Wait and Watch! Update: Chrome OS now features the ability to install Android Apps from Google Play Store! Definitely check that out! You can download Chrome OS latest builds from here. On how to install Chrome OS on your PC, check this link. Remix OS is a PC oriented version of Android. It is developed by Jide Technologies. True Android does have Android x86 which can be installed on Desktops & Laptops. But it has compatibility issues & certain apps won’t work in Computers. Remix OS is far more user friendly than Android x86. The official Android x86 project supports Remix OS. The main feature of Remix OS is that it fixes the compatibility problems of apps from Google Play Store. And there are familiar features like Close, Maximise & minimise buttons. You also have a User friendly File manager built-in. Right Click context menu is another feature which Android x86 doesn’t support. But Remix OS supports it. Personally I like Remix OS & I’m using on my PC alongside Windows 10. The stability has surprised me even if it is in early versions. You can also expect an improved battery life with this. You also have a Start menu where All apps are listed Alphabetically. It also has Windows 10 style Notification Bar & Keyboard shortcuts support. All the Android apps work seamlessly & you can also install WhatsApp on Remix OS. For editing documents you can use WPS Office Android App. You can update OTA with Remix OS. Updates are delivered to your PC. Update: We’ve informed that the Remix OS project is discontinued – instead use Android x86 project ISO for installing Android on your computer. Solus OS is a highly customised Linux Distribution which is aimed at the masses.It is Open Source & is actively developed by Solus Project. Its exceedingly simple & minimalistic that you feel that you’re using it. It’s main quality is that it is Easy to Use. Most Linux distributions are critized for their dependence on Command Line (Terminal) for Software Installations & customisations. However, Solus OS realises that end users feel at home only when they get familiar GUI to use. It allows users to update built-in apps using Graphical UI. Every tweak, configuration, and optimization enables us to deliver a singular, cohesive desktop experience. Solus OS provide experiences that help make computing easier for everyone, ranging from providing media codecs to extensive hardware support out of the box.It is built from scratch, providing us the freedom to provide a single integrated experience without being beholden to the interests of other projects or corporate agendas. Solus OS runs on Budgie, the customised Desktop environment which focuses on simplicity & elegance. It makes it simple for anyone to use. Budgie desktop tightly integrates with the GNOME stack, employing underlying technologies to offer an alternative desktop experience. Budgie Menu has a drop down Category-wise listing style. It also has applet cluster named Raven. Raven features abilities to easily access calendar information, sound volume, media player controls, and more via Applets view.It enables to manage incoming application and system notifications via Notifications view.You can customize your Budgie and system experience by changing GTK and icon theming & you can add, remove, and modify Budgie panels, their properties as well as their displayed applets.You can obtain quick access to system settings and power options such as restart, suspend, and shutdown. Elementary OS is a replacement to Both Windows & Mac. It’s because Elementary OS features a UI similar to Apple’s Mac OS X while having features similar to Windows, while still being a Linux based OS. It has customised Photos, Music & Video Player applications tailor made for the best experience on PC. You can see the Mac Style Dock on Elementary OS. It is resource friendly & easy to use. Mac Users will feel at home using this one. Elementary OS features built-in Midori Web Browser. Midori lets you use HTML5 websites and web apps while being lighter on battery life. It’s open source, & the source code is available for modification to anyone. You can download Elementary OS from its website like this. Go to Homepage. You can see Pricing Options like $5,$10,$25 & $ Custom. Type $0 & then click Download Elementary OS. That’s It! You can try these free Operating Systems in your Computer & I can assure you that It will work on your PC. Previous article Beelink Pocket P2 Review: The PC stick companion for your Television! Thanks Frank, good to know that this article was useful to you! Keep checking back TechBuzzIn for more! Thank you Kill(or is your name Jonnie?) ! Anyway such a comment is what every blogger like to hear! Do check TechBuzzIn for more updates! That’s to nice to hear Gagan. If you have any old computers in your home just check these out as it can provide some life to them. Currently I use Chrome OS & Remix OS(both in dualboot) in my old laptop.